4 - 5..........Vello von Fürstenfeld. Overall Structure: Powerful, dense hard hair, colour somewhat unclean, masculine, strong upper head, upper head line not parallel, strong enough jaw, back is short and firm, rump slightly rounded, good angulations, strong bone, inclined to amble, good strength of the back and ligaments. Nature: Behaviour in the group natural and impartial. Middle sharpness, protective instinct, fighting instinct, courage and hardness is very high. Note: Suitable for improvement in character / introduces blue in the line. Ikarus von der Kollau passed the Körung 'for life' with highest possible rating for hardness and working drives (very high protection, fighting spirit, courage and hardness with middle sharpness). He lived to 10 years of age. Fenja: SchH 3 and passed the ZTP with 1B rating for character and G for conformation. She is the dam of the vom Dragonerreich “A, B, D” litters (Amor, Bess, Doc). Larry: SchH 3, IPO 3, FH, IDC-Weltmeister in 1997, D.V. Leistungssieger in 1995-1996 and passed the Körung 'for life' with highest possible rating for hardness and working drives. 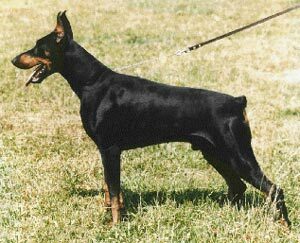 He is sire of the von Warringhof “L, M, O” litters (Orka). Lobo: IPO 3, IDC-WM participant and passed the ZTP with 1A rating for character and SG for conformation. Lucky: SchH 2 and passed the Körung 'for life' with Körklasse 2A rating. She is dam of the vom Eschenbruch “A” litter (Avanti). Mike: SchH 3, DV-DM participant and is dam of the von den Hassbergen “B” litter (Bandit). Melissa: SchH 3 and passed the ZTP with 1A rating for character and V for conformation. She is dam of the von der Mooreiche “Q, R, U, W” litters (Rica, Riska, Wendy). Natasia: SchH 2 and is dam of the von der Mooreiche “S, T, V, Y” litters (Yoker). Gerry: IPO 3, DV-DM participant, IDC-WM participant (placed 8th in 2000) and passed the ZTP with 1B rating for character and SG for conformation. Hel: SchH 2 and passed the ZTP with 1A rating for character and V for conformation. She is dam of the von Warringhof “N” litter (Naomi).